There's an agency called `The Faunafonds´ in the Netherlands, whose sole purpose is to compensate people for any damage they say they have been caused by animals on the country's protected species list. So that makes the animals double-untouchable: it's illegal to kill them, and the government covers the costs of any damages they are responsible for. 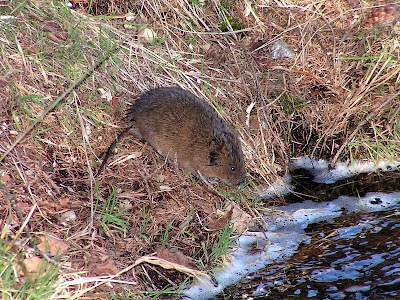 There's a fascinatingly specific table of damage caused by each species in each of the past 5 years _ for instance the "Water Vole" (Dutch: woelrat), which caused EUR700,000 in damages last year, but less than EUR20,000 this year. "The financial damage done to fruit growers by song birds grew explosively last year ... Especially "Conference" pears, which have been planted in a wider area in recent years, have suffered from birds." "The damage caused by songbirds remained pretty much the same"
It turns out there was a hanging bill (if you can forgive the pun) of EUR200,000 left over from the year before, hence the increase in costs. ANP, correctly, pointed out that the agency paid out EUR6 million in claims, but missed the total taxpayers' bill: EUR10 million (US$16 million). Now, that's peanuts for most government agencies, and the Faunafonds does provide work for 12 people, according to its annual report (Dutch). But the main story wasn't songbirds. Yup. They caused nearly EUR3,600,000 in damage all by themselves _ more than half the agency's payouts. Up EUR600,000 from a year earlier. "The reason that the damage done by migrating geese and other waterfowl rose is the increase in market prices of cattle feed (grains? 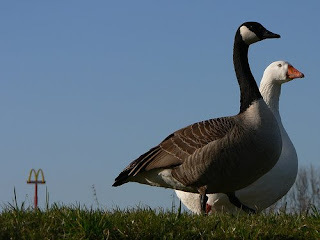 ), due to worse weather conditions, which led to seedlings being less able to grow, and geese were able to do some damage there." "Investigator Bart Ebbinge attributes the increase in damages to an increase in the number of geese. In addition, according to him, farmers chose to register damage claims, since that was more profitable than the management subsidy." 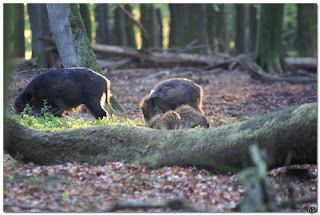 Damage from wild swine tripled to EUR49,000. There's going to be a big stink later this year if the government goes ahead with plans to allow hunters a one-time mass cull. After the `more´, the key table from the Faunafonds report. You have to click on it to see individual species. If it's still too fuzzy, it's on page 15 of the annual report. It looks like the damage from wild hares quadrupled last year, but my personal favorite is the entry on "Hawk": EUR944, a one time claim only, in 2006. Oh no, not the geese! 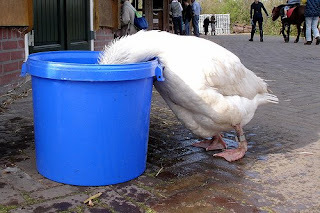 Do you remember the ludicrous campaign, "Eigen Ganzen Eerst" that Michiel Smit from Nieuw Rechts launched a few years ago, calling for immigrant geese from Africa (de Nijlgans) to be rounded up and deported (or shot) because they weren't "integrating" well with Dutch geese? Even the poor allochtoon geese can't get a bloody break from the tulip munchers. @Anon I remember the Michiel Smit thing well & I wanted to write it up, but GeenStijl beat me to the punch I believe and the issue never got any traction. The most amazing part was that Michiel Smit is apparently capable of irony. Or was it unintentional? He was, in fact, serious. His rants about "ghettovorming in de weide" were dead funny though (in a sick, twisted way). Poe's Law in full effect.